Affordable and discreet alternative to platforms and risers. Works with any brand subwoofer which accepts screw-in feet. Fewer complaints from house occupants and neighbors in apartments and townhouses. Cleaner and tighter sounding bass with less floor boom and vibration. The Rockville RV12.2A Dual 12" 1200 watt vented subwoofer enclosure is one of the best bass all-in-one subwoofer packages we ever carried. This package is better than others on the market. 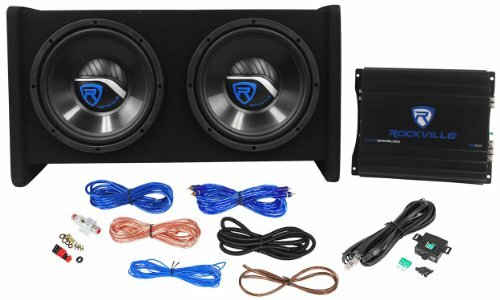 This system includes a top of the line ported enclosure which gives you more punchy and better sounding bass. The vents were strategically placed on the bottom of the enclosure and then the enclosure is placed at a 15 degree angle to fire the bass out hard and give you amazing sound quality. 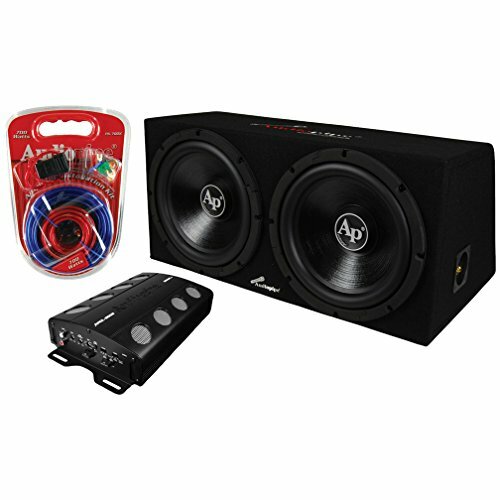 This package also includes a mono block bass amplifier vs. most packages that have a 2 channel stereo amplifier. This mono amplifier is built just for loud bass. The amplifier is CEA-2006 compliant so you can be 100% sure you will get the power you expect. This is one of the only packages on the market that is CEA-2006 compliant. Most brands are unable to do this because they inflate their power ratings. CEA-2006 compliant means that these are tested and rated by the same industry standards used by other famous brands like Kenwood, Sony, Kicker, etc. The subwoofers in this package are of superior quality. They feature high power 1.5" aluminum 4-layer voice coils with bumped and vented magnet motor structures among other features. 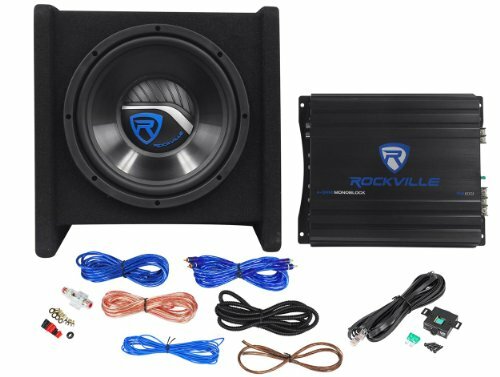 The distinct advantage of the Rockville Bass Packages are that our systems from the woofers to the enclosures and amplifiers were all designed and engineered from scratch to work specifically together as a system. We tested these for months to ensure these met our rigorous quality standards. The final result is a super efficient bass response with loud, deep and clean sound. 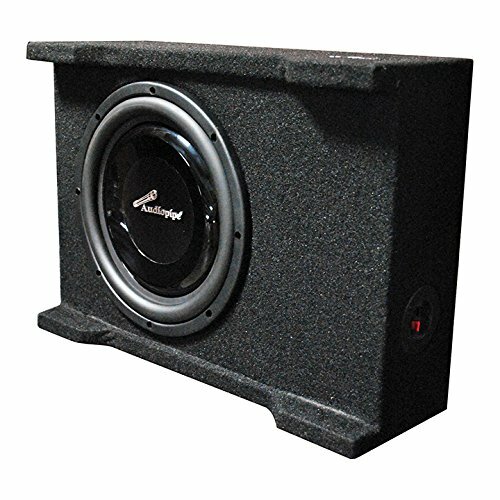 The Rockville RV8.2A Single 8"" 800 watt vented subwoofer enclosure is one of the best bass all-in-one subwoofer packages we ever carried. This package is better than others on the market. 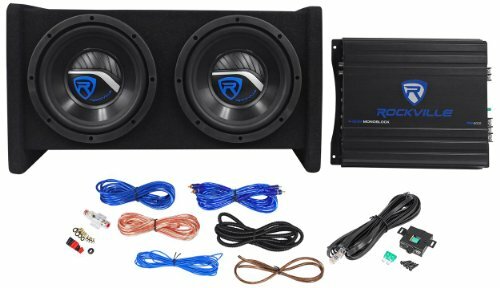 This system includes a top of the line ported enclosure which gives you more punchy and better sounding bass. The vents were strategically placed on the bottom of the enclosure and then the enclosure is placed at a 15 degree angle to fire the bass out hard and give you amazing sound quality. This package also includes a mono block bass amplifier vs. most packages that have a 2 channel stereo amplifier. This mono amplifier is built just for loud bass. The amplifier is CEA-2006 compliant so you can be 100% sure you will get the power you expect. This is one of the only packages on the market that is CEA-2006 compliant. Most brands are unable to do this because they inflate their power ratings. CEA-2006 compliant means that these are tested and rated by the same industry standards used by other famous brands like Kenwood, Sony, Kicker, etc. The subwoofers in this package are of superior quality. 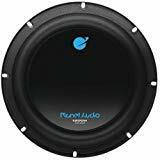 They feature high power 1.5"" aluminum 4-layer voice coils with bumped and vented magnet motor structures among other features. The SVS Sound Path Subwoofer Isolation System decouples and isolates the subwoofer from the flooring, resulting in tighter and cleaner sounding bass, less buzz/rattle in the room, and fewer complaints from adjacent neighbors in apartments and townhouses. It's the next best thing to sound-proofing! 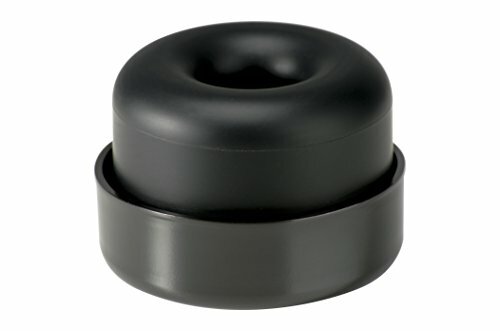 The Sound Path Subwoofer Isolation System works with any brand of subwoofer which accepts screw-in feet. Developed with extensive accelerometer and acoustic measurements, this system features optimized durometer elastomer feet which significantly reduce floor vibration. The Sound Path Subwoofer Isolation System ships in packages of four(4) or six(6) feet with three popular thread sizes in various lengths to accommodate a wide range of subwoofers, regardless of brand. 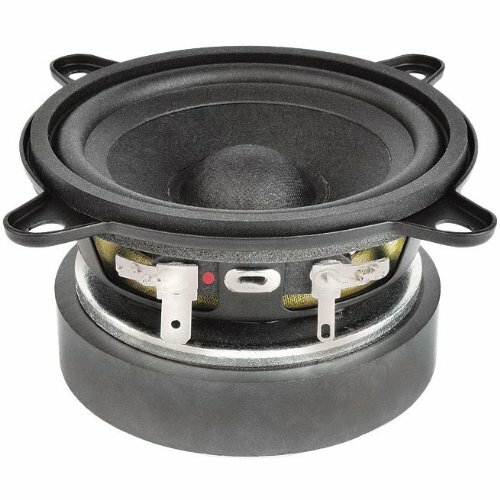 FaitalPRO's do-it-all 3FE25 ceramic ferrite 3" full range speaker has high sensitivity and flat frequency response. 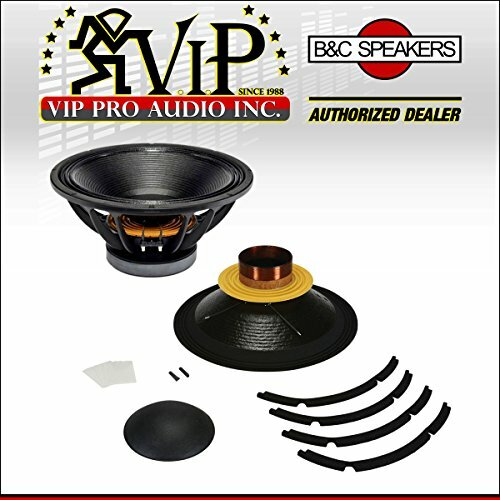 Perfect for use in pro, home, and car audio applications. Bluetooth Mode: Bluetooth 3.0 Specifications, support HSP, HPP,A2DP,AVRCP format. With English language notification. Bluetooth pairing name: soundbar lp-08. Line In Mode: Connect the speaker by stereo cable. speaker will enter into Line in mode, and notification sound" LINE IN" . The use your smartphone or other connected device to play music. We highly appreciate all customers'opinions to improve the selling, please contact our customer service department for probable best solution if you are not pleased with our products. SPECIAL DESIGN - This soundbar is with unique design makes the sound. Unit Sixe: 40mmx2. It is AntiMagnetic,AntiNoise and HQchipset. With LED indicator light and spin button more easy to operate. With built-in microphone, you can even use this speaker for answering calls . BLUETOOTH 3.O TECHNOLOGY - This soundbar is with Bluetooth 3.0, bluetooth module adopts RF technology. Effective distance can reach to 10 meters. It also support HSP, HPP,A2DP,AVRCP format. You can stream music from your multimedia device directly onto this speaker . MULTI-MODES SPEAKER - This soundbar is with 2.0 CH multimedia speaker system. 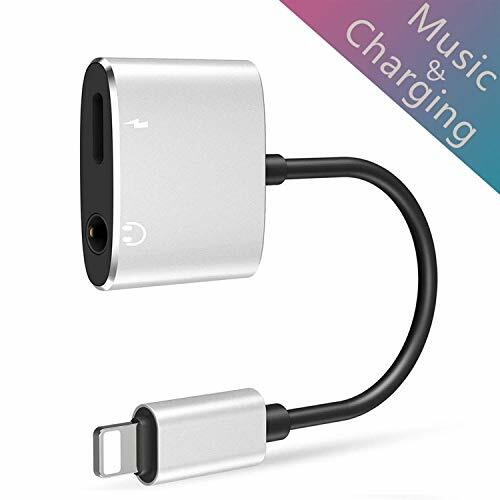 It can stream your music through bluetooth connection. With 3.5mm line-in jack, also support external audio devices, allows you to stream music to your other devices. It also support TF Card mode, enjoy your favorite music from your TF Card . LOWE POWER PROTECTION - When the battery power is lower than 3.3v over than 15s,there is a warning sound: Voltage is insufficient, pls charge. And then battery power is lower than 3.1v over than 15s, speaker's notification sound is power off then turn off. Bulit-in 3.7V 1800mAh battery, use the use cable to charge it after power off. Very easy to operate . SOUNDBAR SPEAKER - Powered by 2 x 5W drivers, distortion-free at maximum volume.Super bass stereo soundbar, noise reduction effect, perfect for home, dorm room, kitchen, bathroom, car, parties. Tips - If you want to connect this speaker with your TV, pls make sure your TV with 3.5mm Aux hole and this speaker only work for Analog TV, not for Digital TV . 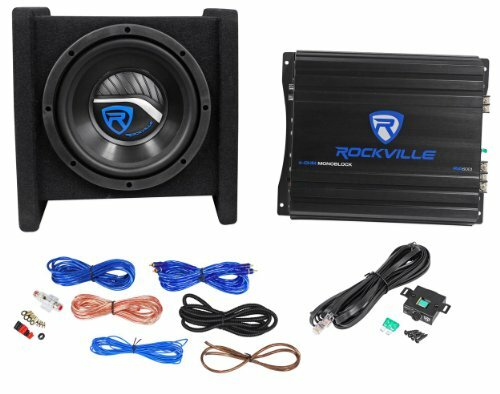 The Rockville RV8.1A Single 8" 400 watt vented subwoofer enclosure is one of the best bass all-in-one subwoofer packages we ever carried. This package is better than others on the market. 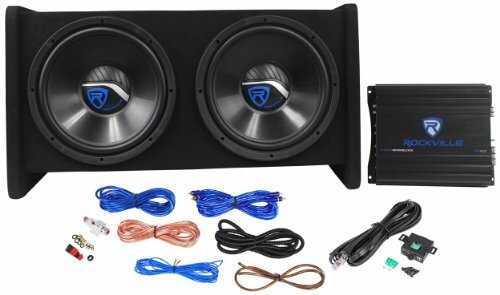 This system includes a top of the line ported enclosure which gives you more punchy and better sounding bass. The vents were strategically placed on the bottom of the enclosure and then the enclosure is placed at a 15 degree angle to fire the bass out hard and give you amazing sound quality. This package also includes a mono block bass amplifier vs. most packages that have a 2 channel stereo amplifier. This mono amplifier is built just for loud bass. The amplifier is CEA-2006 compliant so you can be 100% sure you will get the power you expect. This is one of the only packages on the market that is CEA-2006 compliant. Most brands are unable to do this because they inflate their power ratings. CEA-2006 compliant means that these are tested and rated by the same industry standards used by other famous brands like Kenwood, Sony, Kicker, etc. The subwoofers in this package are of superior quality. They feature high power 1.5" aluminum 4-layer voice coils with bumped and vented magnet motor structures among other features. Rockville RV10.1A Single 10" Bass Enclosure System With matching Mono Block Amplifier. 500 Watts Peak Power / 175 Watts RMS CEA-2031 Rating. Single 10" Bass Enclosure System with matching Mono Block Amplifier. 4 Layer, High Power. RMS Power: 175 Watts CEA-2031 Rating. Peak Power: 500 Watts. Frequency Response: 40Hz - 500Hz. SPL: 92dB @ 1w/1m. 50oz Magnet Motor Structure Weight. Total Cabinet Weight: 19 Lbs. Dimensions: 13.4 (L) x 15.9 (W) x 13.8 (H). 1200 Watts Peak Power. Power Output: 200 Watts RMS CEA-2006 Power @ 4-ohm and <1% Minimum THD. Signal to Noise Ratio: >97dBA (Reference: 1Watt into 4 ohms). Frequency Response: 15Hz - 20KHz (-3dB). RMS Power: 400 Watts @ 2 ohms. 4 Ohm Mono-Block Class A/B. Fully Adjustable +/- 12dB Narrow Q Bass Equalizer @ 45Hz. Fully Adjustable Low Pass Crossover: 50Hz - 250Hz. Fully Adjustable Subsonic Filter: 10Hz - 50Hz. Damping Factor > 200 @ 100Hz. Input Gain Control: 150mV - 7.2 Volt. Wiring Kit Features: 17 High Grade Twisted Pair 100% Copper RCA Cables. 17' 8 Gauge Translucent Blue Super Flex Power Cable. 3' 8 Gauge Clear Super Flex Ground Wire. 17' 18 Gauge Blue Remote Cable. 17' 16 Gauge Speaker Wire. 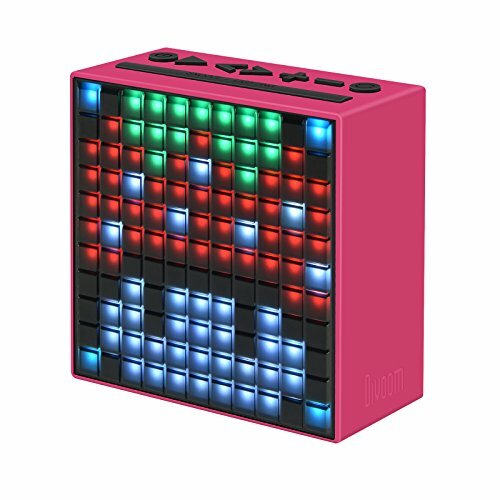 You can now create your own pixel art easily with the Timebox, as well as sharing your works with friends and family..
12 pictures, you can be creative, to make your own pixel animations on the Timebox. Equipped with 121 high quality full RGB LED, these pixels can deliver up to thousands vivid colors, the luminosity as a 3W night lamp. And you can adjust the brightness at your finger tip. Packed with a 5 watts driver with passive radiator, Timebox is a fine-tuned with DSP(Digital Sound Processing) technology. The latest 4.0 bluetooth smart transfer technology, enable a stable, faster connection for your favorite music playing. Catch up with the latest music billboard, or stay tuned with the news broadcast. Enjoy all the exciting entertainment by your favorite local radio station. Hold snooze button or use in- app function to record your message. Surprise your love ones when they turns on the Timebox. Built-in microphone provides the hands-free calling function, where you can enjoy the conversation without interrupting the task on your hands. over 30 preset professional sleep-aid and smart alarms with both visual/audio supports. Fall asleep faster and wake up feeling fully energetic. Sleep aid:over 30 preset professional sleep-aid and smart alarms with both visual/audio supports. Fall asleep faster and wake up feeling fully energetic. Other built-in functions: FM tuner, temperature sensor, microphone, social media notification etc... All speakers purchased through the Divoom's official Amazon store (Divoom Official) come with the one year limited warranty.